Our studies on the documentation of stamped handles in the collection started with those classified as "Early Rhodian-Button Type Stamps" which are now known to have been produced in the Rhodian Peraea on the south-western coast of Anatolia (1). Documentation studies after this group were followed by Rhodian eponym and fabricant stamps, Chian stamps and the stamps of Nikandros Group and Koan stamps. 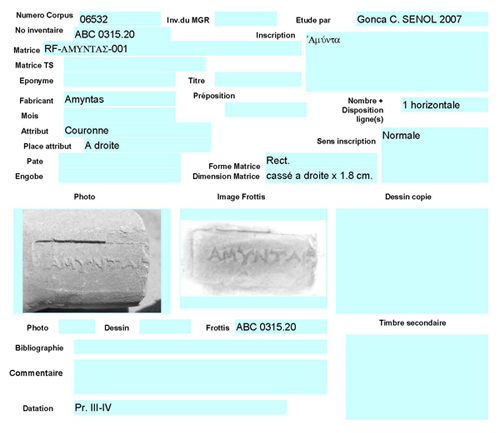 After taking notes about each stamp, a rubbing of the inscription on a cigarette paper is made and a digital photograph of each stamp is taken to add to the file to constitute a complete database on amphora stamps. For the stamps of different origins, different files have been created to allow the researcher to reach the stamp or to get the necessary information in question easily. The other reason for creating varied databases is because of the matrix systems applied to each different group. Although the starting point and the logic of the matrix system are not entirely different among the groups, the difference of groups in origin causes there to be some diversity in the matrix numbers containing the origin of each handle, the quality of the fragment (i.e. amphora or lagynos for Chian stamps), the attribution of the stamp to a person (eponym, fabricant, to a person of unknown function and varied homonyms), extra information obtained from the stamp (i.e. month-names for Rhodian stamps) and the numbers given to each different impression. For the documentation and database of stamped handles, we have used FileMaker Pro 8.5, which provides the most effective storing of information in varied forms (text, photo, drawing) and is not a complicated software for searching and comparing the data. Of course, different database softwares can be used, but for all the documentation of the CEAlex FileMaker is preferred in order to share data easily. This software allows one to create and to multiply forms with any information one may wish to store. For a storage database, the necessary titles and the characteristics of the information must be decided to create a kind of page (form) model with fields that will be filled with the information. The varied information obtained from the stamp is written in these different fields on each page (form). The programme permits one to add new fields to the database or to delete some unwanted fields, if necessary later on. It is also possible to create new models containing less information with fewer fields when someone needs these kinds of models according to the direction and subject of his/her studies. Making a list or lists is available with the necessary information chosen from the entire form. To search for a certain stamp with one or more necessary characteristics, one can enter the information about the stamp required. Importing or exporting forms to/from another database is also possible when needed. To create a form containing all the information about the stamp, the form model proposed and used by J.-Y. Empereur (2) is applied with the addition of some extra titles and information, such as the images of photos, rubbings and drawings, and some simplification in the search process (3). The following titles for fields containing all the characteristics of the stamp and the information about it exist on the forms of the database of amphora stamps (4)(fig. 6). The above-mentioned items are essential on the form of each stamp to present and to give all the information of the stamp. 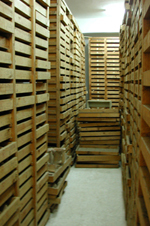 All the stamps from Alexandria (both held in the collections of the Museum and from the excavations of CEAlex) are documented with this system for the complete database of stamps. (1) SENOL-SENOL-DOGER 2004, p. 353-360. (2) EMPEREUR, GUIMIER-SORBETS 1986, p. 134 and 139. (3) SENOL 2005, p. 151-153, and fig. 11. (4) This form is used currently for the database of Rhodian amphora stamps but it can be used for the stamps of varied production centers. For instance all the stamps found in the rescue excavations of CEAlex, the stamps from the excavations of Bibliotheca Alexandrina and the stamps in other collections in the Graeco-Roman Museum are documented on this kind of forms. See also the discussion under the title Notes on the Documentation of Amphora Stamps of Other Centers in this paper. (5) For the database of the stamped handles from the rescue excavations of CEAlex, only one field for the inventory number of each stamp (as the other material from the excavations) exists on the forms, in addition to the corpus number. (6) The month-names are inscribed on the Rhodian amphora stamps dated to c. 240 BC. (7) The given titles are for Rhodian stamps. The titles appearing on stamps of other centers, ie. andron, archon, damiorgos, phrourarchos indicating the eponym on Knidian, astynomos on Sinopean stamps, keramarchos (in Thasos), kerameus (in Knidos), ergasteriarchas (in Sinope) pointing out the fabricant can be added to the forms when preparing a complete database. (8) All the rubbings are scanned and copied on the form of each stamp. (9) All the profiles of the handles with lips are tried to be drawn and scanned in a file containing all the drawings. A drawing number is given to each drawing and the drawings are later attached to the related forms. (10) There are files containing all the drawings, photos and the rubbings. The photos and the rubbings of stamps from other sites (excavations of CEAlex or other collections in the museum) have the same numbers with the catalogue numbers and they are documented and stored in order with regard to these numbers.